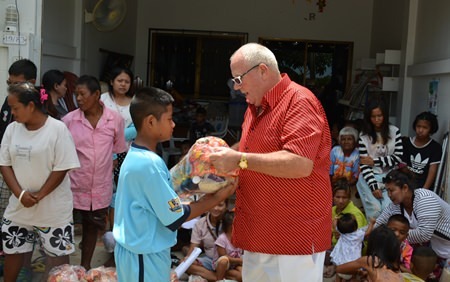 Earlier in the year the Thai Farang initiative (TFi) teamed up with the Rotary Club Eastern Seaboard to provide clean water filtration systems to families of Kate’s Project on Soi Siam Country Club. This gave the TFi team a real opportunity to see the living conditions of these families most of whom make a living by collecting disused plastic bottles, glass and paper from garbage bins. Greig Ritchie is a new member of TFi and was delighted to see where the money goes. 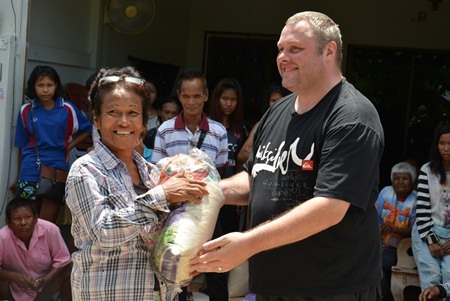 On the morning of Saturday the 20th of June, TFi once more paid a visit to these families, this time to hand over 45 food parcels, each containing 5 kilos of rice, 6 tins of fish, cooking oil, fish sauce and Mama noodles. 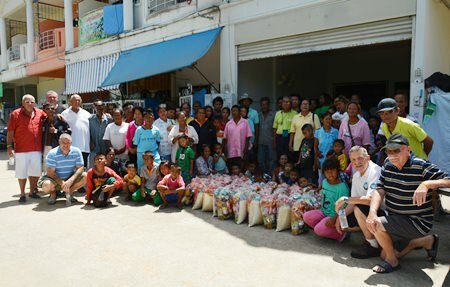 Noi from Kate’s Project once again brought the families together to receive the parcels. TFi team members Rodney Charman, Joe Cox, Matt O’Sullivan, Greig Ritchie and Paul Strachan handed out the parcels to the very appreciative families. These families are truly thankful for a little help. TFi was set up with the ethos to create fun events for charity. Due to the low season, events have been put on the back burner; however, they are putting money previously raised to good use and try to when at all possible to take on projects or deliver what is needed rather than just giving money. TFi is also assisting with food for a malnourished baby under the care of Hand to Hand Foundation and is looking into creating a project to provide motorbike safety helmets for children. 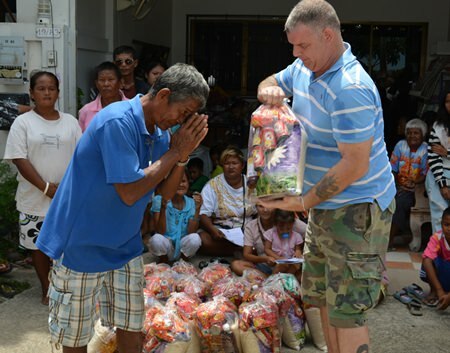 TFi team member Matt O’Sullivan helps distribute the food parcels. Time for a quick group picture before the parcels are given out. Previous articleWhat about the employers?